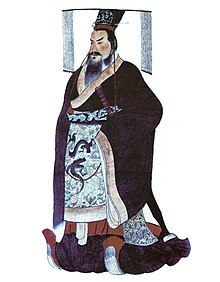 Qin Shi Huang Di was an emperor. Qin Shi Huang (Chinese: 秦始皇; literally: "First Emperor of Qin"; 18 February 259 B.C. – 10 September 210 B.C.) was the founder of the Qin dynasty and was the first emperor of a unified China. He was born Ying Zheng (嬴政) or Zhao Zheng (趙政), a prince of the state of Qin. He became the King Zheng of Qin (秦王政) when he was thirteen, then China's first emperor when he was 38 after the Qin had ruled all of the other Warring States and unified all of China in 221 BC. While Yiren was a prisoner in Zhao, he met a trader named Lü Buwei. Lü knew that, when King Ze went to death, Yiren's father Lord Anguo would be the leader of Qin. Lü also knew that Yiren had many brothers but Yiren's father loved a woman who had no son. Lü worked hard to make that woman adopt Yiren (take him up as her son); Yiren even changed his name to Zichu ("son of Chu") because his new "mother" was from a land named Chu. Lü's design turned out well: he and Zichu secretly went out from Zhao and, when Ze and Lord Anguo died, Zichu got to be the ruler of Qin. The ruler of Zhao was angry but Zheng's mother hid. He was not able to kill her or her son. Zheng's mother had been the girlfriend of Lü Buwei, but Lü gave her to Yiren when he fell in love with her. Sima Qian was not certain that Zheng was the son of Zichu and not the son of Lü Buwei, but most people thought that he was the son of Zichu, ruler of Qin. When Zichu died, Zheng got to be the new ruler of Qin. Because he was still very young when this took place, his mother and Lü Buwei were the true rulers. The land of Qin in 210 BC. Later, Zheng was older and put Lü Buwei and his mother's new boyfriend to death. He put his mother away as a prisoner as well. Now, Zheng and his helper Li Si ruled Qin. Their ideas are called Legalism. It said that the old ways of doing things were not good: if everyone did as ordered by the ruler and by his laws, things would be much better. The best way to run a country was for the ruler to have all the power. That way, no one would be able to fight or hurt other people. As the ruler of Qin, Zheng liked these ideas; as the ruler of China, he said they would be the only ideas. He made Confucianism and other old ideas against the law. Only the library in his palace (great house) was able to have books with any old ideas or with other people's accounts of history. Everyone else would have to read about Legalism and the accounts of history approved by the Emperor. The First Emperor's men then burned the other books and even killed some of the men who tried to keep them by burying them (putting them under the earth). As the ruler of China, the First Emperor ordered great undertakings: his men put together earlier bits into a Great Wall of China and made a new river—the Lingqu Canal—so that boats were able to go from the Yangtze River in the middle of China to the Pearl River in the south. He ordered a large number of new roads and a tomb (last resting place) for himself the size of a city. This resting place was looked after by the thousands of statues of the Terracotta Army. Many people did not like doing as the First Emperor ordered: Sima Qian wrote about three men who made attempts to kill the First Emperor. All three came to nothing. The First Emperor did not want to die. He went to Shandong and Jiangsu to look for people who would be able to make him live forever. No one was able to do that, but some people think that Xu Fu's journeys to look for Penglai were important for Japan. This was about the time Japan's early Jōmon stage ended and its Yayoi stage started. The Yayoi time was the start of farming and the start of large countries in Japan. The First Emperor died in 210 BC. The First Emperor had many sons, but his helpers Li Si and Zhao Gao tricked the one he liked into killing himself. That way, a younger son became the Second Emperor and Li Si and Zhao Gao was able to be the true rulers for a while. The time when the First Emperor's family ruled China is named the Qin Dynasty, but it was very short. After the Qin, there was fighting that accidentally burned all the old books placed in the First Emperor's library. Then, there was more fighting before Liu Bei came out on top and got to be the new ruler of China. His family was named the Han Dynasty. ↑ Duiker, William J. & al. World History: Volume I: To 1800, 5th ed., p. 78. Thomson Higher Education Publishing, 2006. ISBN 0-495-05053-9. ↑ 4.0 4.1 4.2 4.3 4.4 4.5 Sima Qian, put into English words by William Nienhauser the Younger & al. as The Grand Scribe's Records [The Great Writer of History's Records], Book 1 The Basic Annals of Pre-Han China [The Basic Written Accounts by Year of the History of China before the Han Rulers], pp. 87–126 and pp. 127–176. Indiana Univ. Press (Bloomington), 1994. ISBN 0253340217. Accessed 25 Dec 2013. This page was last changed on 2 April 2019, at 19:18.